Powers/Abilities: The full range of Marilla's Terrigen mist-fueled mutations have not been explored beyond the obvious cosmetic changes (it is presumed the spots, three toes, and bulky head (especially in the lips and jaw) are mutations, but what is individual variation vs. actual mutation is unconfirmed -- we never saw her pre-mutation AFAIK--Snood; further the spots could be the equivalent of "liver spots" in mainstream humanity, given her age) to her appearance, though she did demonstrate a measure of super-strength. Whether she suffered limitations, such as a decreased immunity to terrestrial pollutions, is unrevealed. At a minimum, she likely possessed conventional Inhuman longevity, as she was mature for close to a century without appearing geriatric. An experienced royal nanny, Marilla countered her nurturing side with a gruff, brusque personality towards anyone who doesn't meet what she perceived as befitting a member of the royal court of Atillan. 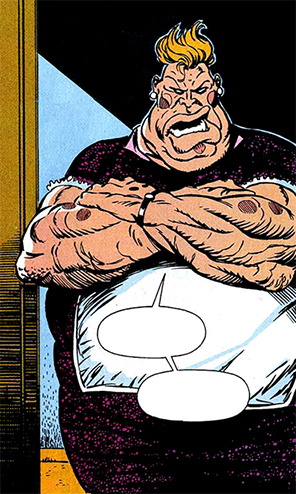 During her stay on Earth, she complained bitterly about the accommodations at Avengers mansion and tried to meddle in the preparation of meals. Despite her claims of culinary expertise, Marilla's tastes vastly differed from what a human might find palpable. (Avengers I#343 (fb) - BTS) - Marilla had served as nanny to the house of Agon for close to a century, taking care of Crystal and the other members of the Inhuman royal family. When Crystal joined the Avengers, Black Bolt insisted Marilla would accompany them to Earth. (Avengers I#343) - Seconds after she arrived at Avengers mansion, the loud, rough and opinionated Marilla made her position as chief caregiver and protector of Luna clear. 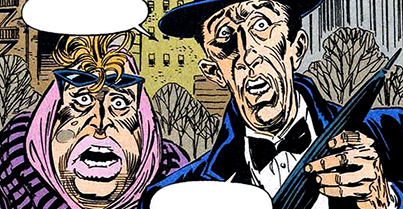 She then proceeded to critique the accommodations, calling the mansion a hovel compared to Attilan, which rather upset longtime butler Edwin Jarvis. (Avengers I#344) - Marilla sampled Jarvis' prepared food while she was down in the kitchen to prepare Luna's bottle. Deeming Jarvis' cooking "swill, dreck, dishwater and poison,", she decided to help out. (Avengers I#344) - Marilla got into a heated argument with Jarvis when he caught her in the kitchen adding "a touch of Menduvian spice" to the diner he was preparing for the team. Marilla expected gratitude for what she deemed an heroic action. Jarvis, however, couldn't get over the fact anyone would dare tamper with his recipes. (Avengers I#348) - On Jarvis' day off, Marilla figured it was her task to take over his duties, all the while complaining bitterly about how she never took a single day off when she was in service to the royal house of Attilan. She nevertheless informed Vision that he had a visitor waiting for him in the lobby of the mansion. (Avengers I#350/2) - While the Avengers were getting involved in the Infinity War, Marilla and Jarvis continued their own never- ending conflict as the nanny kept complaining about the quality of the butler's food. Jarvis finally snapped, claiming the kitchen to be his domain and adding "I do not tell you how to nanny!!" Decidedly steamed at Jarvis' rudeness, and muttering it had been 50 years since anyone had spoken to her in such a manner, Marilla was about to fire back when she noticed Luna needed changing. Later, as Marilla and Luna watched some cartoons, with Marilla showing a distinct interest in Fraggle Rock, Jarvis tried to make amends but was brusquely dismissed. The butler then enjoyed a small measure of revenge when he pinned a sign reading "queen of mean" on Marilla's back as she took Luna for a stroll through a rather crowded Central Park. (Avengers I#350) - In the days following Operation: Galactic Storm, the Avengers hosted an informal party for the Starjammers when they came to Earth to pick up their team member Binary (Carol Danvers). Marilla, strict about Luna's bedtime, interrupted the festivities to collect the girl from her mother. When Black Widow asked Marilla if she'd seen the Black Knight, she promised to swing by the hangar and remind Dane Whitman of the party. When Marilla and Luna arrived at the hangar, they interrupted a fight between the Black Knight and Starjammers member Raza Longknife. Seizing the opportunity, Raza ripped Luna from Marilla's hands and threatened to kill her if the Black Knight didn't lower his weapon. When he complied, Raza tossed Luna back to Marilla and stabbed Black Knight, claiming he'd never planned to hurt the child, but required a ruse. (Avengers I#356) - In the aftermath of the Gatherers' infiltration on Avengers mansion, Black Widow and the Black Knight were still recovering from the savage mental assault unleashed by the Gatherer known as Cassandra. The two Avengers remained at the mansion while their teammates chased the Gatherers. However, the stubborn Black Knight ignored doctor's orders and joined the Widow in surveying the damage caused by the Gatherers' incursion. The Knight soon collapsed from his injuries, however, just as Marilla and Jarvis arrived to take both heroes to their quarters to get some rest. (Avengers I#357) - In preparation for a celebratory dinner to commemorate the six month anniversary of the Avengers' current line up, Marilla decided to bring in the entire kitchen staff of the royal house of Attilan to cook the meal. A shocked Jarvis needed to be comforted by Crystal, who also berated Marilla for overstepping her bounds and not informing anyone. Claiming she wanted it to be a surprise and expressing wonder at who could say no to such delicacies as Kendalyian boar hide, gnarled radishes and Orwlyian blood pudding, Marilla figured she was doing everyone a favor, as usual. When Jarvis regained his composure, he took back command of the kitchen and ordered away Lockjaw, who was chewing on a bone on the floor. Upset, Lockjaw made his way upstairs with Marilla in pursuit. After calming the canine Inhuman down, they both went to check on Luna and ran into Screener, a member of the Acolytes, sent by Fabian Cortez to check on Luna's genetic background. After confirming the child was indeed "merely" human, Screener used her powers to make both Marilla and Lockjaw forget they ever saw her. (Avengers I#358) - Marilla expressed noticeable discomfort when she brought Avengers house guest Philip Jarvert his dinner. Amused at the notion she considered him some sort of ghost, the alternate reality hero offered Marilla to touch him in order to confirm he was, in fact, alive. Kindly refusing, Marilla revealed how she'd heard of the Swordsman, how he died saving his great love Mantis and how his lifeless corpse was subsequently taken over by a sentient, talking plant who eventually married Mantis after all. Stunned at this tale, the Swordsman called it the most absurd or horrific story he ever heard, angering Marilla who insisted this was exactly how she'd heard it told. The discussion was interrupted by the Vision, who overheard their conversation and offered to show the Swordsman the history of his 616-counterpart. (Avengers I#359) - While taking Luna out for a stroll in Central Park, Marilla and Edwin Jarvis encountered Hercules' ladyfriend Taylor Madison, who was sitting alone on a bench, looking distraught. Marilla didn't want to disturb her, but Jarvis insisted they said hello anyway. Quickly hiding her tears, Taylor made small talk with Jarvis and Marilla, but got upset and rushed to say goodbye the second Jarvis brought up the subject of Hercules. Marilla told the baffled butler that Taylor was obviously a woman in deep pain. (Avengers I#362) - Overcome with a distinct feeling of dread in the middle of the night, Marilla checked in on Luna who turned out to be sleeping peacefully. Trying to convince herself it was little more than superstition and nerves, Marilla went down to the kitchen to make herself some tea, mixed with some fine, old Attilan brandy. On the way back, she ran into the Black Knight who was trying to track an energy pattern inside the mansion that matched the ones left by the Gatherers during their previous incursion. Unbeknownst to anyone, Proctor had replaced the Vision with the Gathererer called Anti-Vision who was ordered to kill the Swordsman. After leaving the Knight to his work, Marilla found the lifeless form of the Swordsman in the hallways. Her shriek alarmed the others, just as Crystal shook the mansion with a seismic wave while trying to ward off the Anti-Vision. The Avengers engaged the Gatherer, who was eventually rendered immobile by Sersi who turned his organic plastic into a crystalline compound. (Avengers Annual I#22/1) - Marilla was present at Avengers mansion when several 6th century marauders invaded and attacked Hercules, Vision and Crystal. (Avengers I#367) - Unbeknownst to anyone including Marilla, baby Luna was kidnapped by Fabian Cortez of the Acolytes. (Avengers I#368) - As the nation state of Genosha descended into full blown civil war, SHIELD director Nick Fury assembled the Avengers from both coasts to New York and ordered them to stay out of the conflict. After some pushing, Fury revealed the reasons behind this command: there were reasonable concerns the warring Genoshan factions might strike out at the Avengers to make a statement about mutant-human relations. Crystal instantly realized this was all about her daughter and she rushed to Luna's side. Marilla tried to calm the distraught Inhuman mother down, telling her they were just about ready for a walk in the garden. Hugging her baby, Luna revealed herself to be the shape-shifting Genoshan mutate 682. After delivering a speech about how the whole world would soon share the mutates' suffering, it exploded. Crystal's elemental powers kept everyone present, including Marilla, safe from the blast. (Captain America I#422 BTS) - Resident inventor and Avengers Support Crew member Fabian Stankowicz's behavior had become so bumbling and disruptive, he was considered a nuisance. Not in the least by Marilla, who had grown increasingly frustrated by Fabian's bumbling behavior and unreliable inventions. (Captain America I#422 - BTS) - Marilla was preparing Luna's breakfast: "goatmeal, or whatever it is these humans call this gruelish confection..." when she inadvertently tripped over one of Fabian's little robots who had escaped from his workshop. Incensed, she promised she'd see him fired or she'd leave herself. Upon hearing this, the somewhat mentally unstable Fabian jumped the gun and decided to quit before someone would fire him. Reasoning the Avengers didn't need his services as an inventor after the recent return of Hank Pym to active duty, and deeming himself useless otherwise, Stankowicz figured he might as well just kill himself. Cap's timely intervention spared his life. (Avengers I#373) - Marilla returned with Edwin Jarvis from a shopping trip and was shocked to see Avengers headquarters in ruins, after Sersi destroyed it during a maddened fit. She immediately took care of Luna as Crystal, Quicksilver and the other Avengers went off to deal with the threat at hand. (Avengers I#375 (fb) - BTS) - After Proctor and the Gatherers were defeated, Ute the Watcher used his dying breath to undo all the damage Proctor's reality warp had caused. However, Avengers Headquarters was not restored. Instead, a replica of the old Avengers mansion appeared in its place. This was apparently a result of Immortus' manipulations. (Avengers I#376 (fb) - BTS) - Exploring their new old headquarters, the Avengers discovered a high tech door lodged inside a wall that seemingly led nowhere, but radiated transtemporal energies. Current crises prevented them from researching the door's origins. (Avengers I#380) - Marilla was looking for Luna in Avengers mansion, eventually finding the little girl in Crystal's quarters. Luna seemed obsessed with the full length mirror inside the room, but Marilla paid little attention to the girl's passionate pleas of "unca unca," picking Luna up and heading for her bedroom just as the frantic face of the Black Knight appeared in the mirror, calling for Crystal or the Avengers' help. His summons echoed in vain. (Ultraforce I#10) - In the midst of a fight between Ultraforce and Loki and his summoned Frost giant, Ultraforce member Black Knight decided to use a scrying pool to summon help from his home dimension. Focusing on what he loved the most, Dane Whitman pictured Crystal and managed to display his image on the dress mirror inside her room. Crystal's daughter Luna was the only one who saw "unca Dane" appear, but lacked the cognitive and vocal ability to relay his plea for help before Marilla took her away. (Avengers I#389) -Marilla stood up for Deathcry, when government agent Henry Peter Gyrich invaded Avengers mansion, planning to arrest the Shi'ar teenager for illegally accessing the stargate near Earth's sun on four separate occasions. Calling out Gyrich after he put down both Deathcry and Quicksilver, Marilla followed the young Shi'ar girl upstairs to calm her down, only to discover she'd already gone out the window. As the Avengers went out to look for their alien ward, Marilla ran into Hercules who had volunteered to stay behind on monitor duty. Marilla admitted her worries to him, stating that even among Inhumans she wasn't consider a "prime specimen," which made her especially sensitive to Deathcry's plight on Earth. Hercules comforted Marilla after her confession, calling her a gem beyond value. (Avengers I#390) - Marilla joined the Avengers at Tony Stark's summer home in the Adirondacks, a place alternate reality heroes Magdalene and the Swordsman had been staying at while trying to adjust to life in the 616-dimension. A relaxing day of innocent, sunny fun was interrupted when Hercules returned from a stroll through the woods with the mysterious youngling Tuc in tow. As twilight set, Tuc revealed himself to be a sensitive, capable of reading people's fortunes with his cards. Deathcry, Hercules, Crystal, Quicksilver and Marilla sat around the campfire for a reading. Tuc read everyone's fortunes, revealing stunning and disturbing truths about all present. When he came to Marilla, however, he began to cry and only stated that she should remember that Luna loves her so. The mysterious youth then disappeared without a trace. (Avengers: The Crossing#1) - Marilla was present at the Mansion when past Avengers, Force Works members and other alumni like the Beast (Henry McCoy) gathered to celebrate the anniversary of the team's founding. Marilla was a bit preoccupied with Luna though, who for some unknown reason was acting extremely upset. Marilla figured finding Luna's favorite teddy bear might calm the girl down. She finally found the toy on the steps leading to the sub-basement containing the mysterious, closed, trans-temporal door (that had been mystifying the team since it appeared along with an alternate Avengers Mansion in Avengers I#357). Surprised to see an unusual light coming from that particular room, Marilla went to investigate and saw Iron Man standing inside the opened door. Elated, she approached Stark exclaiming that the others would be very happy to know he'd finally solved the mystery. However, when she saw the look in Tony's eyes, Marilla knew something was wrong. Iron Man (then under mental influence from Immortus to disrupt the Avengers to hold off the Time-Keepers from destroying Reality-616 in order to prevent the Avengers from spreading across the universe) shot Marilla through the head and left her for dead. (Avengers I#391 (fb) - BTS) - Marilla's body was either vaporized by a subsequent plasma blast or otherwise hidden to hide the evidence. (Avengers I#391 (fb) - BTS) - Though her body was never found, the Vision found organic residue in a maintenance shaft, which his bio-scanners indicated to contain Marilla's DNA. (Avengers I#391 - BTS) - Giant-Man (Henry Pym) confirmed the Visions' findings, noting her to have been a victim of a high-intensity plasma-blast, and that the murder had tried to hide the evidence. (Iron Man I#321-322 - BTS) - Marilla's death at the hand of Tony Stark was acknowledged. (War Machine I#20 - BTS) - Tony's murder of Marilla was mentioned. (Age of Innocence: The Rebirth of Iron Man#1 - BTS) - While the alternate reality (Earth-96020) teen Tony Stark got used to his new existence in the 616, the Avengers reviewed the crimes committed by his deceased counterpart, chief among them the murder of Marilla. Marilla certainly was a cut above Luna's previous nanny Maya, introduced during Steve Englehart's Fantastic Four. Played as a welcome source of comic relief, her dedication to Luna and Crystal were inspiring. 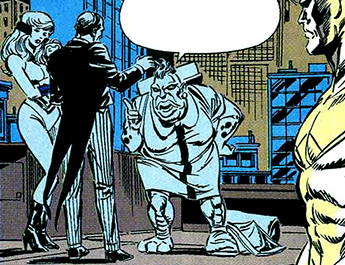 It's especially interesting to note that near her final appearances, the gruff, superior attitude gave way to show a caring, insecure woman who could sympathize with those less fortunate because she herself was from a society where her mostly cosmetic Terrigen mutations made her a second class citizen at best. Also of note: her somewhat dated speech patterns showed Marilla was relatively old, compared to most other Inhumans who had been in more recent contact with the outside world. Ahura's last name is given in Medusa's OHotMU A to Z Hardcover#7 entry. It follows the precedent of <Given Name> Bolt<father's given name> for males, as per Blackagar Boltagon for Black Bolt, who's father is Agon. Marilla, a small town in upstate New York.